1. What led Michael Gallo at Belimo® to test and purchase Box Latches™? As a manufacturing engineer, Michael Gallo knew there had to be a more cost effective and environmentally friendly way to transport parts received from his company’s downstream suppliers in Waukesha, WI and Rochester, NY arriving at Belimo’s USA assembly plant in Danbury, CT. His employer was deeply interested in lean manufacturing principles that would support the company’s sustainability mission. Michael’s goal of streamlining the assembly process for Belimo’s products peaked in the summer of 2016 when he learned about the value and availability of the Box Latch™ and how, with innovation, its use could fulfill these objectives. 2.What does the end-user of this narrative manufacture and assemble? Belimo is a listed clean technology company with a staff of more than 1,400 worldwide. The company is a global market leader in the development, production, and marketing of actuator and valve solutions for controlling heating, ventilation, and air conditioning systems. Actuators, control valves, and sensors make up the company’s core business. Their products help create comfort, safety, and efficiency in buildings while providing solutions that increase energy efficiency and reduce installation costs. 3. What led Belimo to pursue a closed loop transportation system with Wisconsin Metal Parts (WMP)? Because of the high quality production of parts manufactured by WMP’s Waukesha, WI firm and their eagerness to fill any and all of Belimo’s needs, these parties have been working together for a decade. Thus, when Michael looked for ways to save money and improve the transportation of parts from Wisconsin to Connecticut, Dave Holzer at WMP was ready to embrace any ideas that would work. Further details of this low tech solution can be found in Section 2, Question 5. 4. How will this affect Belimo’s plans for dealing with suppliers in the future? 1. As an end-user manufacturer of finished products for sale, which of Eco-Latch Systems’ (ELS) Box Latch™ Products does Belimo use? Belimo USA has been using the Box Latch™ Medium since the summer of 2016, with increasing application in packaging, storage, line-assembly and transportation systems. 2. On which Box Latch™ Products does Belimo want to focus for this narrative? The Box Latch™ (BL) Medium in the past and the BL Large for the future. However, as a manufacturing engineer, Belimo’s Michael Gallo also is interested in the Box Latch™ Small with one or two Anchors. That is a one piece unit in the final stages of development by ELS. Its beauty is that it is can remain on boxes and weighs less than half that of the other Box Latch™ Products. However, since that product still is in development, and because of its versatility, Belimo USA purchased 2,500 of the BL Large in August 2017. This will allow for expanded use of their latches on ever increasing sizes and wall thicknesses of boxes. 3. With respect to this specific product, the Box Latch™ Medium, how long has Belimo been using it? More than one year in the Danbury, CT and Hinwil, Switzerland facilities. 4. How did Belimo find out about this product? Michael viewed it at the Box Latch Products website. A prior purchase had been made by Belimo headquarters in Switzerland where Box Latches™ are used to close boxes during circulation on conveyors that, ultimately, are placed on pallets using a vacuum lift device. 5. How is this Box Latch™ Product used during Belimo’s assembly process? The latches are used in multiple settings. A) Past vs. Present. In the past, Belimo’s solution for transporting metal parts from suppliers to their production lines had been via wooden crates. (Figures 1 & 2) These wooden crates hold parts well, but have many disadvantages. They are 1) heavy, 2) easily damaged, 3) expensive, 4) difficult to move, 5) space inefficient, and 6) do not mesh with Belimo’s lean manufacturing vision. While investigating creative solutions, Michael and his team thought that using an existing, reusable, corrugated box was the best option. What was missing was a method to easily open, close, and secure the boxes. Thus, Box Latch™ to the rescue. The result for Belimo was the elimination of an estimated $15,000 in expenses to purchase a new set of wooden crates. Supported by the Belimo lean production team, Michael designed and purchased box partitions, illustrated below in Figure 3, for approximately $500. This produced a savings of $14,500 vs. purchasing a new set of wooden crates. Belimo employs these previously used, and now re-purposed, boxes in an external closed loop system to transport parts from Wisconsin Metal Parts in Waukesha, WI to Danbury, CT. Figures 3-5 show the creativity of this team on the floor of Belimo’s 300,000 sq. ft. manufacturing and assembly plant. When empty, the empty boxes are stacked eight-high, shrink wrapped on pallets, and shipped back to WI at a far lower cost than transporting the heavy, wooden, space-wasteful crates. As an example of the savings, when one actuator part was shipped in a wooden crate, it held 120-pcs per crate. Thus, 20 wooden crates held a total of 2,400-pcs. With parts now being shipped 80-pcs per corrugate box, 2,560-pcs occupy the same space as did the 20 wooden crates. Even more impressive, a pallet with 20 empty crates at 50 lbs/crate weighs 1,000 lbs, while a full pallet of 32 empty boxes weighs a mere 180 lbs. This produces an environmental benefit and transportation savings of 820 pounds less freight to return the boxes. It also cuts the number of pallets shipped in half because each pallet now holds twice as many pieces as did the wooden crates. When this is multiplied by the 80 shipments per year between CT and WI, the savings on freight alone is $75,670 per year. Add in the $17,030 saved by not having to buy new wood crates, and total savings = $107,000. Run the numbers for five years, subtract the cost of partitions and Box Latches™, and you get a grand total of $476, 903 – all because of the innovation stimulated and provided by the use of the Box Latch™. Talk about a whopping ROI on $550 worth of Box Latches™. It is hard to see where another investment this small could generate an ROI this big. This reduces the number of boxes needed, a savings that has not yet entered into this equation. It also reduces dunnage costs for recycling boxes, and at the same time it produces huge savings to the sustainability of the environment. The frosting on the cake is that eliminating the wooden crates frees up expensive floor space for more assembly cells, meshing well with Belimo’s lean manufacturing principles. B) What end-user products does Belimo assemble? The Belimo valve and actuator products depicted in Figure 6 and others like it. C) What assembly problem has Belimo solved as they produce these products? The problem involved the receipt of individual parts from their supplier in heavy wooden crates. As an element of their continuing lean initiatives, the wooden crates produced high freight costs, required excessive material handling, and were inconvenient for the material handlers and assemblers. As one example, Belimo would receive 1,400-pcs of one metal part stacked flat in a wooden crate (Figure 8). To position the parts at a higher elevation for easier access by operators, the full wooden crate was placed over an empty one. At each cell, assemblers had to remove a small quantity of parts from the crate located across an aisle. Every element of this material handling was inefficient. Going forward, the material handlers will drop skids of 1,600-pcs, as seen in Figure 7, occupying the same footprint as the wooden crates that held 1,400-pcs, shown in Figure 8. Moreover, the individual boxes on the skids now can be loaded directly into the lean assembly cell, reducing the number of part touches. 6. What did Belimo do before using Box Latch™ Products? Belimo’s material handlers previously lifted parts out of the large wooden crates seen in Figure 8 and placed them on the assembly tables or in smaller plastic totes at the back of the assembly tables seen in Figures 12 and 13. The parts that previously were delivered in wooden crates and stored in the aisle across from the assembly cell now are placed to the left of the station as shown by the arrow in Figure 13. At some assembly cells, parts were delivered or stored in the black or blue plastic totes seen in both of these photos. Many of these totes will be replaced with the open, compartmentalized boxes seen in Figure 15. 7. What are the benefits of this new system? A) Partitioned Boxes. By using smaller, reusable, partitioned boxes to hold parts closed with Box Latches™, the lean production team has eliminated extra touches of parts. At the same time, this new system facilitates easier loading of boxes filled with parts into the ever leaner assembly. B) Replacing Plastic Totes. To further improve sustainability and the transport and flow of parts in Box Latch™ closed boxes, Michael’s team came up with an idea that replaces the plastic totes at the end of the right arrow in Figure 13 with custom produced boxes. As seen in Figures 14-15, this innovative box has only two major and no minor flaps. The minor flaps on this rectangular box are removed and placed under the center section of the inserts. This adds strength to the box, and fills the void in the middle of the bottom of the box so that the partitions lie flat across the entire surface. This makes it simple to close the boxes with a Box Latch™, hold them open with yellow plastic clips purchased from Bee Packaging and replace the plastic totes with lightweight, re-usable boxes as shown in Figure 15. When these boxes are stored at their work stations, assemblers merely reach into the compartmentalized boxes at the left end of the assembly station (Figure 13) or up and into the new, small boxes shown in Figure 15. Parts now can be removed one at a time instead of in handfuls, as was the case when they were delivered in wooden crates. It also allows for replacing empty boxes with full ones as assemblers load and unload their cells from the back side. The empty boxes are closed with latches, palletized, and returned to the start point of this closed loop system in Wisconsin. Many of these changes reduce “one or more touch points” for each product assembled. The expectation is that this will increase the number of products per shift, resulting in reduced operation expenses. 8. What number of Belimo’s products involve the use of the latches during production? The total volume of parts used and various products sold where Box Latches™ participate in time and material savings are in the tens of thousands per year. On the production side, Box Latches™ were tested first with one part to see if this closed system would work as desired. 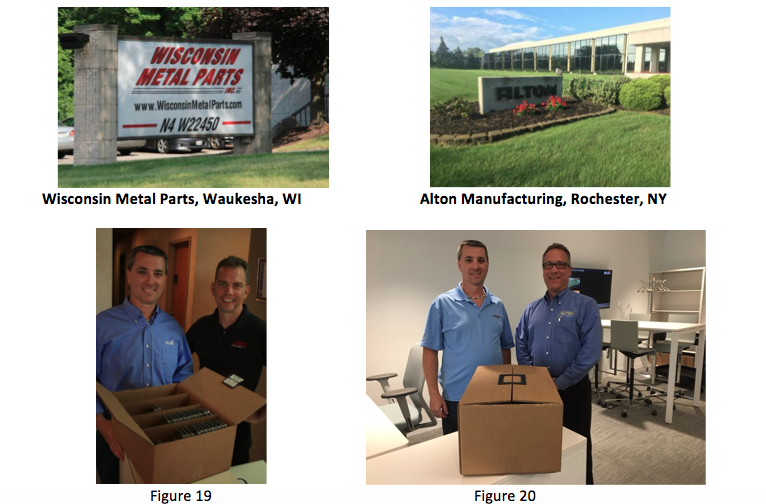 Because of the success of that test, Belimo is now using reusable boxes and Box Latches™ with five different parts produced by two different suppliers, i.e., Wisconsin Metal Parts in Waukesha, WI and Alton Manufacturing, Inc. in Rochester, NY. 9. Acceptance by Belimo’s suppliers of parts? When this idea was introduced to downstream supplier, Wisconsin Metal Parts, their staff willingly participated in the adoption of this innovative, low technology system built around the concept of re-using materials. Figures 19 and 20 show Belimo’s Michael Gallo with WMP’s Dave Holzer and Mike with Alton Manufacturing’s Steve Dukatz, celebrating the success of this closed loop, box re-use project. 11. Does Belimo have plans to use other Box Latch™ Products? This idea and process developed and implemented with Wisconsin Metal Parts has been so successful and cost effective that it now is being pursued with a second stamped part from WMP, as well as with additional parts shipped from downstream supplier Alton Manufacturing in Rochester, NY. The concept also is being applied within Belimo’s internal closed loop manufacturing and product assembly process in other sectors of their Danbury, CT plant. Prepared by Jim Wilson, CEO, ELS, Box Latch™ Products with assistance and permission from Mike Gallo at Belimo, Dave Holzer at WMP, and Steve Dukatz at Alton. *Data that monetizes the savings on tape and recycling dunnage is expected in early 2018.